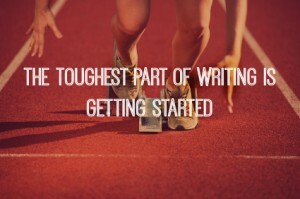 I’ve always felt that the hardest part of writing is getting started. There’s a mental inertia that I have to overcome. I know it must be done. I know the longer I wait, the worse it will be. I know that once I get going, it will get easier — that words will start to flow. But knowing all that just makes me want to take a nap. Or get coffee. And a muffin. The very thing I have been wanting ….